Define Seasoning (a post by Josh) – Eat Me. Drink Me. I don’t know about you, but the most vivid memories I have of my grandparents revolve around the dinner table (dinner, supper, lunch, whatever you want to call it). Usually there would be a giant wooden table joined by eight or ten or twenty chairs, plates, and sets of silverware. I would show up and talk with my family for a bit, then we would extend our visit over the table, passing food dishes as we passed our life updates. There was never too little food, no matter what my grandparent’s economic situation may have been. Come to think about it, I never thought about it because there was always so much food. A turkey, mashed potatoes, beans, beets, green beans, onions, biscuits, corn, sweet potatoes, you try and name it, and I’m sure I’ve seen it on the table at some point. My grandma usually tended towards the latter and would serve up a heaping piece of pumpkin pie or chocolate pie topped high with baked, homemade meringue. We would get up, stretch, feel the bulk of our plates in our stomachs and re-situate on the couches and continue talking. Really, our meals were part II of our visit. Why do I talk about this? Well, I’ve been dining like that a lot recently, but in restaurants. There is this beautiful thing in the South, where people like holding on to traditions like boarding houses or eating in big groups or enjoying conversation over a meal. So far I’ve found three restaurants that encourage inter-group conversation: Mrs. Wilkes’ house in Savannah, Walnut Hill in Vicksburg and The Dinner Bell in McComb. Each have their own traditions and each have their own specialties. The one thing that they truly have in common is they all give you plenty of opportunity to fill up for the day (or the next three). Savannah seems like so long ago, but Mrs. Wilkes’ seems like yesterday. I don’t know what that says about Mrs. Wilkes, but it must be a good thing. Born in the 1940’s, Mrs. Wilkes’ house started out as a boarding house where boarders would take three meals and lodging. The meals were all communal, almost cafeteria-like. As people started not to need the lodging part, Mrs. Wilkes herself started to open the place for just food. Since about the 1970’s, people have been lining up outside of the small door to dine on supper from anywhere between 11-2pm. 1. Get there pretty early, or at least 30 minutes before you know you’ll be hungry. Why? Because you are going to wait in line. A long line. 2. Keep track of how the line progresses. Two people don’t enter at a time. Five people don’t enter at a time. No matter who is the line, ten people will enter at a time. Why? Because you will be dining with them at huge family-style tables. 3. Bring your appetite. Why? Well, because when you sit down you will be greeted with an already-set table full of about twenty dishes. 4. The only thing you’ll be asked is: to pass the dish, any sweet tea?, would you like biscuits?, and which dessert would you like? That’s right, on top of twenty dishes you also get a dessert. 5. When you are done, take your plate(s), silver, and cup to the back, just like they did in 1943. Not much has changed since 1943, especially the recipes. While I was there I met nine other wonderful people, each with different stories of how they got there. Although we came from different walks of life, we all came there to eat, drink and, well, be merry. What I found in Mississippi was similar, with its own twist (spin, maybe?) on communal dining. The round table restaurant looks a little something like this: A huge round table taking up the entire room, eighteen chairs around it, and in the center of the table a huge Lazy Susan. The Lazy Susan is a strange approach to dining, because it means you have to eat close to people that you don’t know, but you don’t have to actually ask them if they could “pass the peas,” you can just spin them your way. At the same time, you have to know when the appropriate time to spin the wheel is, since you may spin it when someone is trying to dish a heaping spoonful of squash casserole onto their plate. It’s all in the timing. I ended up eating at two of these round table dining places: Walnut Hill in Vicksburg, Mississippi and The Dinner Bell in McComb, Mississippi. Walnut Hill was founded way back in the 1800s as a tea room. Now there are about three different ways of thinking of the “tea room’. Walnut Hill looked like a house, creaked like a house, so I assumed the tea house part of it was a reference to women eating without men. But no, as the owner informed me, it was a whiskey house. She also gave me a wink when she said this. I’m still not sure what that wink meant. 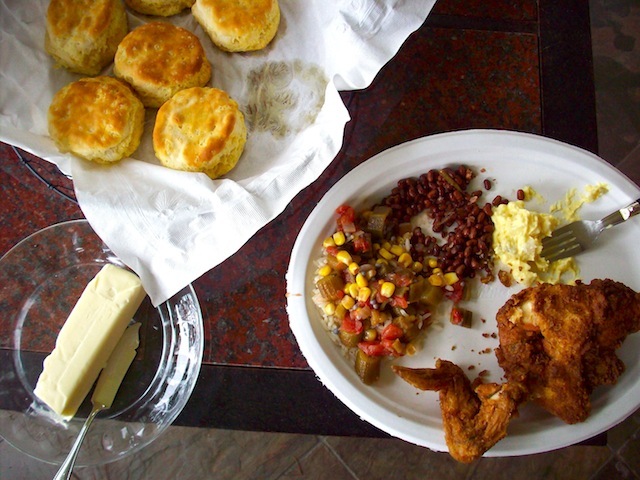 Either way, the food was great – all that a southern meal was cracked up to be. I personally remember the melt-in-your-mouth Harvard beets. They were smaller beets that had been pickled then candied then warmed up and served to us with the crimson red juice running around the bottom of my plate, painting everything I ate red. And oh were they good. Sweet, earthy, great texture – they had my grandma’s beets beat. The Southern fare (fried chicken, potatoes, bread, beans, peas, etc.) is pretty comparable at the Dinner Bell and Walnut Hill. The big differences were in the seasonings. The Dinner Bell relied on time-tested seasoned foods, which left them a bit bland for my taste buds (oh so excited to get to New Orleans soon). I preferred the fried chicken at Walnut Hill, but the Dinner Bell’s was good. The Dinner Bell also was fully engaged in the round table restaurant idea – there were no other tables available (like Walnut Hill’s set up). The Dinner Bell’s owner also greeted us and wished us good eats before we started. He was always present and engaged, which to me was the sign of love and soul. Eating together is so important these days, and I’m glad I’ve found a few restaurants that believe in that too. I do have to rant for a second and say there have been too many times that I have gone out to eat, looked around at other tables, and never see any one talking. Let me give you a classic example: the couple that has been together for 23 years and likes going out to dinner because it’s a treat. But when they get there, they sit at the table, read over the menu in silence, speak only to the waiter to get the food that they want, and the rest of the noise coming from that table would be the knives scraping on the plate to symbolize a clean cut. Where is the conversation? Let us remember what companion means: one you break bread with. A companion is also someone you talk with, share with, and love. Let’s bring food and good company back together. If it takes going to Savannah, Georgia to get some good food from Mrs. Wilkes, then so be it. Buy your ticket now. It’s worth every penny and minute stood in line.